Mick Jones knows a thing or two about songwriting. 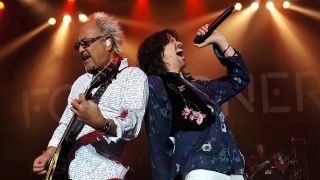 With 80 million album sales and dozens of chart hits behind him, the Foreigner mainman know more about the art of wrestling a memorable chorus from the most basic of musical ideas than, well, just about anyone. 2017 saw the release of an album compiling Foreigner’s greatest hits: 40 tracks spread across two CDs (23 tracks if you buy the vinyl version) featuring the multi-million selling Juke Box Hero, the multi-million selling Waiting For A Girl Like You, and a veritable feast of other, equally commercial juggernauts. The album also featured two tracks recorded specifically for the compilation: Give My Life For Love, and a new version of I Don’t Want To Live Without You, a song that topped Billboard’s Adult Contemporary Chart back in 1988. We asked Mick to critique his own catalogue and nominate his 10 favourite Foreigner songs. He gave us 11. One of the songs that signified the slightly dark and tense atmosphere that I felt was a very important part of our directions. Probably the closest we ever came to the atmosphere of a Steely Dan track (dare I say jazzy?). Smoky and seductive. This was the first song I wrote and recorded on the piano. It was a landmark event in my musical history. This song reiterated foreigner’s British personality: soulful, bluesy and quirky. A simple and romantic love song with a touch of country. Definitely in my top three faves ! A recent addition to our live show. A song I never get tired of hearing or playing. The saddest song I ever wrote. Amazing to see — night after night — this powerful and universal message resonating in almost every country in the world. One of the first parings of a rock band and gospel choir. This song has over the years developed into our big rock anthem; powerful and slightly satirical and the most exciting song in the show. First song I wrote with Lou, describing his trip to New York (where I was putting the band together) and his entry into Foreigner. Another quirky soul song, with one of the greatest sax solos by the late great Jr. Walker, and the freaky riffs supplied by Thomas Dolby. 40 by Foreigner can be ordered now.